The year is almost at and end, and banking promotions abound this holiday season. One of these is from Bank of America where they promise to give you an extra $50 for opening a checking account with them. What you need to do is simple, first you go to their website and fill in the online application using the offer code GROUP50. Then make sure you set up a qualifying direct deposit within 60 days after you open the account. Bank of America will deposit your $50 bonus directly within 120 days. It’s that simple. 1. Gives you all the benefits of online banking as you bank from your own home, paying bills, depositing or withdrawing without having to go to the bank, going through traffic and waiting for your number to be called. 2.You get an optional Bank of America Debit Card .You also have access to over 18,000 ATMs from where you live to anywhere in the world. 3.You can add to your savings with Bank of America’s unique “Keep the Change” feature. Your purchases are rounded up to the next dollar amount so the difference is transferred to your savings account. Talk about added interest. 1. Only one incentive per customer is allowed. 3. You have not been a signatory on a Bank of America checking account that had been closed within the past 3 months. 4. 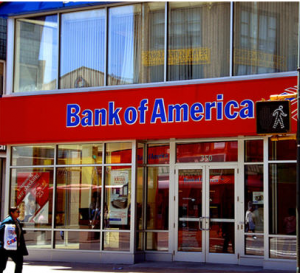 Keep your new checking account open until Bank of America is able to verify its eligibility. (Usually, this does not exceed 120 days). 5. This offer cannot be combined or made eligible with other offers. 6. Minimum deposit required to your new account is subject to normal opening deposit requirements for the kind of checking account chosen. Bank of America is the fifth largest company in the US in terms of total revenue.It is also second to Walmart among the non petrol companies in America. It also ranks second largest bank holding company in the US in terms of assets. Forbes listed the Bank as the third biggest company worldwide. As of August 2009 it held 12.2% of all bank deposits in the US. The Bank has bragging rights to 6,000 locations across the USA plus another 300 offices abroad.